We’re eating tender baby back ribs cooked low and slow and basted with a blueberry chipotle stout barbecue sauce. Just because I chose the rainiest day of the year in San Diego to make ribs doesn’t mean that I was stuck outside getting drenched in the inclement weather. Oh no! While grilled ribs are always preferable, you can achieve very moist and tender ribs by cooking them at a really low temperture for many hours in the oven. You won’t have the same smokey flavor that the grill provides, but when a hommie wants some damn ribs, she doesn’t always care if they’re smokey or not! (Plus, the addition of the smoked paprika and a little chipotle in the bbq sauce adds a slightly smokey flavor.) While it wasn’t this exact recipe, the family that I used to personal chef for requested my baked ribs more than pretty much any other meal. So, if you find yourself snowed in this winter why not crank up the oven, eat a little bbq and dream of summer? Remove the membrane on the back of the rack of ribs. Start by sliding prying it away from the ribs with a butterknife or your finger nails. Gently slide your fingers under the membrane to separate it from meat. Once you've worked your fingers underneath the membrane and can grasp it with your hands, you should be able to gently pull it off the rest of the way with your hands. Once the membrane is removed cut the rack into two half-racks. Mix all ingredients for the rub in a small bowl and stir to combine. Evenly coat all surfaces of the ribs liberally with the rub. Wrap the seasoned ribs tightly in plastic wrap then place in the fridge for at least 6 and up to 12 hours. Preheat oven or grill (for indirect heat) to 250 degrees. Remove the ribs from the fridge and let sit at room temperature for 1 hour before cooking. If using the oven place the ribs onto an aluminum foil-lined baking sheet, if using the grill they can go directly on the grate away from direct heat or in a rib rack. Let ribs rest for 10 minutes before cutting into to individual ribs. Preheat canola oil in a medium-sized pot over medium heat for 3-4 minutes. Once the oil is hot add the onion and shallot to the pot. Sweat the onions over medium heat for about 10 minutes, stirring occasionally, until translucent. Add the garlic to the pot. Stir. Cook for another 60 seconds. Add the stout beer to the pot and raise the heat to medium high. Allow the stout to simmer and reduce by half, about 15-25 minutes. While the stout is reducing, place the blueberries, brown sugar and cider vinegar into a small sauce pan. Place over medium heat. Stir until the sugar is dissolved. Cook over medium heat until the blueberries begin to burst. Remove from heat and set aside. Add the blueberry mixture and the rest of the ingredients for the bbq sauce to the reduced stout. Whisk. Reduce heat to medium and simmer for 10 minutes. Allow sauce to cool slightly then transfer to a blender. Blend until very smooth. Strain bbq sauce through a fine-mesh strainter. Taste sauce and adjust seasonings as desired with kosher salt. 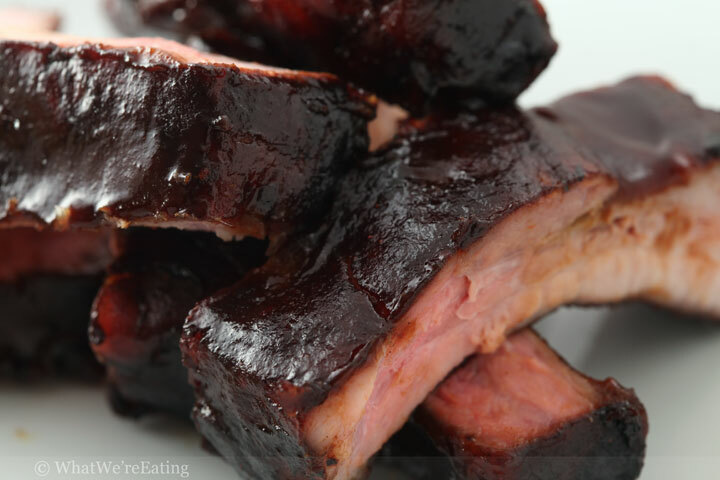 Ribs and blueberries–Craig’s two favorite food groups! OMFG!!! NOMMIE NOMMM NOMMERS NOMMITY NOM NOMMMmmmm!!! BEST EFFING NOMMMING RECPT EVAR!!!! KEEP UP THE NOMMTASTICAL WORK!! !